Dev Diary #21 – Timber! For the past few weeks I’ve been adventuring in the Black Forest, searching for “King Oakenheart” so I can rip some valuable heartwood from his trunk. Like all good loggers, I’ve brought some specialised tools with me, capable of ripping through the many armor cards that trees tend to have in their decks. That strategy has paid off, for the most. I had a couple of set backs, one when the trees started surrounding me and I didn’t have time to deploy my party properly. That highlights the importance of positioning in Card Hunter and that having a deck full of great cards in only half the battle. I’m now deep in the forest, having faced Beech Saplings, animated Maple Trees and the fearsome Oak Bombardiers as well as a few War Monkeys and Goblin Bezerkers to keep me on my toes. Having battled through that collection of monsters, I’m finally ready to face the King of the Trees himself. You can tell he’s a boss monster as he’s a big (2×2) creature, not a regular 1×1 like my characters and most other monsters. 2×2 monsters are generally bad-asses and I’m sure he’ll have some nasty cards in his deck. On the other hand, being 2×2 is actually a drawback in many cases as it means you can’t fit into tight spaces or manoeuvre as easily. In this map, there are some decent choke points that I can use to dodge around him and he’s going to find it pretty slow going wading through all those bushes. That’s a nasty card that will do serious damage if he hits all three of my team with it. So, the first thing I want to do is to scatter to present a harder target. My goal is to break up and attack the King from all three sides. Hopefully I can draw him into the centre of the board too. Urgh! Slowed is exactly what I don’t want when trying to maneuver around. It triggers from any move and reduces it by one. That will turn my Run into a Walk card when I play it. I don’t have any attack cards, which is OK because I may not get into range this round anyway. The Mail is OK and might stop that Acorn Bombardment from doing any actual damage. Discard a card. Draw a card. Simple, but effective. Not much use if you like all the cards in your hand, but a great way of getting rid of cards you don’t want. 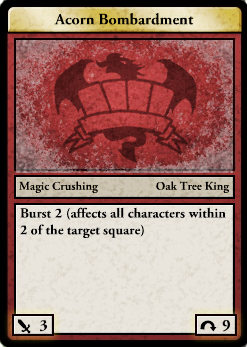 This is a human-only card and these kind of card filtering effects are marked out as a human feature. So the first thing I do is think laterally and chuck my Slowed card. In return I get a Solid Mail – a good armor card but not exactly what I wanted (another move card would have been great). Unfortunately, by starting with Lateral Thinking, I gave the Oak King a chance to attack before I move. And, of course, he leads with Acorn Bombardment. Affecting a 3×3 square, it hits all three of my team. Thorgon and Mistress Elva have no armor so take full damage and Sir Otto whiffs on both Armor rolls – I take a total of nine damage! Not a great start to the battle. That’s what boss monster battles are like though. Thorgon places an Unholy Curse on the King, which makes him take three additional damage whenever he takes damage. It’s a great card for use against singular bosses like this, not so good when fighting large groups of monsters. 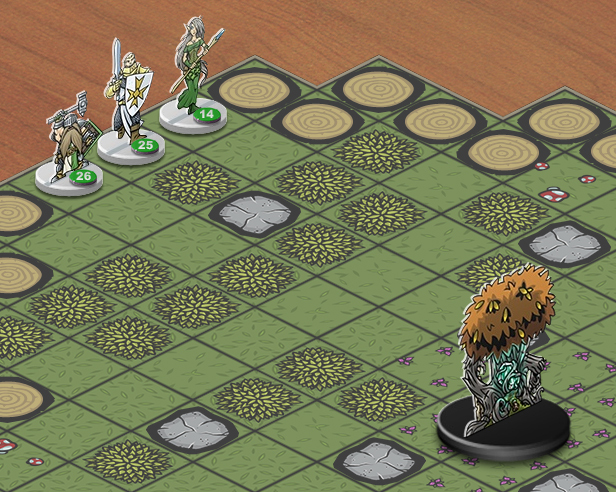 The Oak King refuses to be drawn into the centre of the board, so I have to back him into a corner. That means it’s going to take several rounds to close with him. Luckily, Mistress Elva draws three long range magic attacks in the first round, which pair nicely with the Unholy Curse. The King’s armor saves him from getting too badly hurt though. The King tries to entangle Sir Otto, but he uses his Reflecting Block to turn it back! That halts the King for two turns, giving me plenty of time to close with him. I use Memory Loss to force him to discard some of his super-duper bark Armor. Sir Otto trips again! I really need to add some status removal cards to Thorgon’s deck to deal with this kind of stuff. I have to move Mistress Elva back up behind a boulder since she’s taking a beating from the King’s long range branch attacks. Thorgon puts a Healing Blessing on her which will heal her back up nicely if she can survive the next few rounds. I just try to survive this round. Sir Otto immediately Runs up to the King. The King entangles Sir Otto – too late I’m already next to you buddy! I hit him with a Shredding Strike and force him to discard three Armor cards! Boy, I’m glad I brought that Goblin Can Opener. I follow this up with a couple of big attacks that I’ve been saving and the King goes down! Strategy pays off. That was the last battle of the adventure, so I collect experience and bonus loot. Woo! This was a playtest playthrough and, overall, it went pretty well. 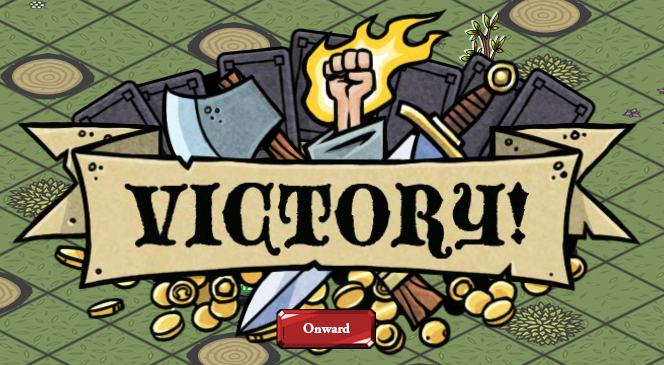 The adventure is moderately challenging but you can really build a deck that is focussed on beating it. It’s probably a bit on the long side – eight battles – and we’re thinking that most adventures will probably be more like six. Some of the other adventures we’re testing are not so well focussed as this one. One useful thing we’ve found from these recent playthroughs is that the adventures that are more like typical RPG dungeon crawls, i.e. a couple of this monster, a few of that and so on, are less successful than the ones that are strongly focussed around a particular theme. For example, our “Zurthine Boltlord” adventure is twelves battles long and has ten different monster types in it. How do you prepare a deck to beat that? So one immediate action task for us is to go back through the adventures and make them more streamlined. Of course, we also found some balancing issues with certain battles being too hard and others too easy as well as discovering some card exploits that need to be tightened up. Skaff, for example, was making much too good use of the Barge card to simply push enemies around and stop them from ever attacking, so we nerfed that card (whilst retaining the mechanic for use on more powerful cards). We learned a lot of other lessons from this testing phase too. Taking the time to playtest is super important to creating what we hope will be a really refined game that will provide challenges and enjoyable play experiences for the long term. We don’t want to make a game you discard once you’ve figured it out. We want to make a game you play for years. pleeeease, can i play”test” as well? If not is the game still slated for an early 2012 release? There will be a Beta, hopefully early 2012. This game looks absolutely amazing! Keep up the great work! Yeah seeing a game play video would make everything you’re saying more understandable and more entertaining to us. Since as fans we’re really interested in playing, it be fun to see a lil gameplay of some kind via video. Wonderful adventure! I look forward to what lies ahead of me as I catch up on these dev diaries. This sort of narration was very well done and it helped me put the game into a better perspective. Definitely excited and I also hope this will be a game I’m able to play for years! Thanks a ton for going through the trouble of narrating a playthrough.